Thanks for the review! I'm currently reading this book. Awesome! Funny how we see the same story in different ways at various points of our lives. 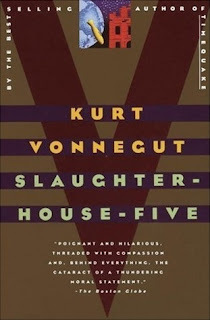 The title for Slaughter House Five came from a real place in Dresden - Schlachthof Funf (Slaughterhouse Five in German) - an abandoned meat warehouse where Vonnegut and fellow prisoners of war were held during WW2. Vonnegut was completely shattered from his war experience, and he obsessed over the horrors again and again in his novels. No wonder the grisly details were so upsetting and "real". I'm teaching his novel Bluebeard right now. The main character is a war veteran, metaphorically and physically scarred by his experience in WW2. Vonnegut never got over it. I'd love to take a course with you. I have Bluebeard on my shelf too. I should re-read that one as well. I love the classics, but this sounds too heavy for me. These days I'm leaning toward cozy reads. Thanks for the review! Read it many years ago - it is a great book! I read it back in university along with all the other Vonnegut books. Now I must re-read the others! My son and daughter was big into Kurt Vonnegut. I've yet to read... Good review, Christine. I read everything Kurt. I read this one a really long time ago when I lived in NYC. He's such an incredible writer.